The trip was awesome. I honestly have nothing to say that could be improved. Great company, workshops and positive atmosphere! – Paula H.
It was a great group of people. I had a lot of fun with them. – Tama C.
I thought this was a fantastic group and I enjoyed learning from the other backpackers. I certainly appreciate the guide sharing his knowledge and experiences. – Sharon J.
I didn't know much about the ethics of backpacking until this weekend. I now know how important it is to apply the "Leave No Trace Principles" while in the woods. I had FUN and that matters most. Thank you again for being awesome organizers! – Sarah N.
The guides did everything possible to make it an enjoyable and worthwhile workshop. They took special care to ensure everyone had a good experience. – John L.
I loved everything about this trip. I had such a great time. This was such a great learning experience and was a great start to more backpacking. – Ben K.
I had a wonderful time this weekend. The guide did a great job leading, and teaching us the skills we need to be successful backpackers. – Terra D.
Excellent guide and location! – Erin V.
What a FUN group!!! We sure were living and laughing and loving life!!! – Cindy S.
I absolutely enjoyed the trip and the workshops. I'm hooked and wanting to learn more about back country backpacking and go on more trips. – Paula H.
I loved the whole experience and can't wait to go on more trips to continue to expand my knowledge. – Margy R.
What a fantastic adventure! What a gorgeous place to spend a weekend Backpacking. Andy did was an excellent leader, always making sure that everyone was having the best time possible. I can hardly wait for the next trip! – Dale D.
I haven't enjoyed myself like that in a long time. Two beautiful campsites, totally different from one another; a very pleasant hiking pace. – Glenn R.
All guides very friendly, helpful & knowledgeable. I learned a lot. This was my first workshop and I thought it was the total package. – Regina C.
Workshops were very helpful - a wide range of equipment was displayed to give us a good idea of the options available. – P.T. Guides are so friendly , approachable and knowledgeable Great help for a newbie!! – Betty S.
The guides were enthusiastic, knowledgeable, and friendly! Honestly I can't think of any improvements! – Mary Beth A. The guide was a great leader and teacher. I highly recommend this trip. – Rita S.
Aside from spending all that time in the beautiful outdoors, I liked the workshops the best. Tama and Andy flawlessly conveyed years' worth of backpacking/camping knowledge to us in an understandable and entertaining way. – Lucy W.
I loved all the hands on activities and the experienced leaders that were there to help. It was lots of fun, and I learned so much!! Thank you!! – Whitney T.
Motivational. This backpacking trip was exactly what I needed to encourage me to continue. – Mike D.
It was a great fall hike with great weather and great people to hike with and share the weekend. I learned lots this weekend. – Bob M.
I enjoyed the activities in the evening and the variety of dinner options – Sue H.
I loved trying the different meals. They were delicious and gave me tons of ideas! – Jaime S.
Excellent! The guides are extremely knowledgeable and great leaders. It was a pleasure meeting new backpackers and sharing experiences. – Jerry R.
This workshop was so informative, fun, and prepared my husband and I to take off on our own. We learned so much and this confirmed our desire to start backpacking. I was a little unsure and uncomfortable with it before but now I can't wait to get back out there. It was a perfect and amazing experience. – Melissa T.
The whole experience was great: very friendly and knowledgeable leaders, great group of women, and wonderful views! – Robin T.
I liked the info about what to pack and how to pack it. This was the most helpful for me. I also learned about the wonders of trekking poles, which I now love. – Carri W.
Great guide with a wealth of knowledge. Well planned and executed. – Narayan R.
I had a great time. I learned so much about backpacking. I really appreciate all the help I got, especially on the hill:) – Patty O. It was great! Thanks to Andy for all the knowledge and wisdom you imparted to us!! Your preparation was top notch! – Vicki G.
I enjoyed this backpacking trip very much. Andy did a great job (as usual) with drawing everyone together into a warm and friendly group. – Wes B. The hands-on workshops with water filters and fire building were especially helpful to me. There was much value in having a guide with Yvonne's vast experience to talk to women about backpacking safety and other issues from a female perspective. – Laurie J. Great introductory opportunity and enjoyed every aspect. Learned a lot valuable information that I will apply to future trips. 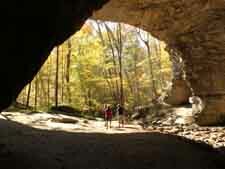 – Pam H.
Loved the caving and guided hikes, also loved the attention to detail and all the small touches. – Maria D.
The guides did a great job. You both did tons of work and were never flustered and always smiling. And you took care of all of us. I really appreciate that. – Tim S.
This was an excellent trip all the way around. I am very thankful I went on this trip. I learned so much and had a great adventure doing it. – Lauren D.
I liked the great trail, great people, and the great time we had. I just wish that bugs didn't like me so much. – Junlan L.
The individual attention the guides gave to everyone was awesome! The guides made everyone feel comfortable regardless of your experience. It was great and I had a blast! – Sharon J. Still trying to absorb the absolutely wonderful experiences I had this past weekend. I highly recommend Outdoor Adventure Connection if you want to learn more about all things hiking. This is my second trip with them, and it was even more awesome than the first one. – Shelly M.
Don't change a thing Andy! I had a fantastic time. – Chris C.
The organization of the trail projects was well planned - we had what we needed, where we needed it. It was nice having park employees join us each day too. – Barb K.
This was an excellent introductory course, and we look forward to enrolling in a Level II course as soon as our schedule allows. – Terra D.
I had the most fun together on Saturdat night and then it was over! Would be nice to have had one more night! The guides were awesome. The park was just beautiful - I will go back! – Theresa G.
It was perfect! – Laurie B.
I think it was great to have a woman as one of the instructors, its a great inspiration to hear from an accomplished and confident woman. – Terry C.
Great company, great weekend! – Barb S.
We both learned a lot. Being new I am not sure what would make it better. The hiking itself was my favorite. – Minette S.
I enjoyed everything about the trip. I learned a lot and appreciated the opportunity to sample so many different freeze dried meals. – Margy R.
I loved being on the trails and being with experienced guides that shared their knowledge. The guides worked hard to ensure everyone had an enjoyable learning experience. Great Job! Thank you for making the opportunity possible. – Odie B. The guides were really informative, and everything was presented in a manner where it was a fun and learning experience. – Ben K.
Loved the presentations, the humor, the information. Andy is a natural teacher, you made the Leave No Trace fun even for adults, and through the chuckles, made it thought provoking too. – Glen B.
Andy did a great job of organizing and leading the trip and the companionship was top notch. – Anne B. The trip was excellent! I could truly write a full page describing my experience and appreciation, but please know that guide and the workshops were absolutely wonderful. Keep up the good work! I hope to join you again on another trip. – Marsha S.
Andy's guidance was probably the best part of the trip and made me feel at ease. – Ashley V.
I loved the teamwork and encouragement. – Loretta H.
Absolutely had a blast! – Rita L.
It was an excellent trip all the way around. It gave me a lot of opportunity to get close to the nature and refresh myself. – Ivin J.
Andy and Tama were great. They made everyone feel welcome and important. Everyone got something beneficial from the experience. The workshops were done very well. – Mike H.
What a fabulous experience! I enjoyed meeting, hiking and laughing with everyone. Thank you for a great adventure!! Your photos capture every aspect of the journey. The beauty of the land, new friendships, laughter and fatigue. – Pat S.
There is not ONE THING I WOULD CHANGE!!!!! The entire trip exceeded every expectation I had. And Andy, you could not have been a more wonderful, helpful, and genuinely kind person!!!! And I mean that 500%. It was especially awesome getting to know you better!! I now consider you more than my "backpacking guide"... I think of you now, truly, as my friend. – Gina B. Was a wonderful trip! Lucy and Yvonne did a great job. I feel everyone learned something even though there was such a vast range of experience levels. – Jennifer P.
I really learned a lot and feel more prepared to go try this on my own. Both Andy and Lucy share the passion they have for this and that's infectious. – Rick S.
All of the guides were amazingly friendly and very knowledgeable. I am very appreciative of everything all of you did. 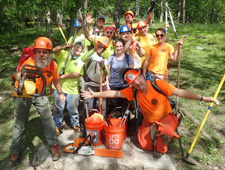 – Rachel M.
I really appreciated the focus of the trail projects and how knowledgeable the trail boss is. – Robin R.
The rain provided yet another great lesson in backpacking reality and how to deal. All in all,it was a great experience, I learned a lot, and I very much enjoyed the company of all of the ladies who were there. – Laurie J. It was the best from beginning to the end. From personal experience, I don't know what you could possibly change or do better. Thank you for a truly exciting adventure. – Regina C.
I loved the whole experience. This was a great trip, the mini training sessions were great and our guides were experienced and willing to share their stories and offer great suggestions and advice. – Joy W.
This was one of the best backpacking experiences I have ever had! – Narayan R.
From Leave No Trace, to the simplicity of food choices, to starting a fire, I was amazed by all of the little tricks. – Rachel M.
It was fun, exciting, challenging, informative and the guides were the best. – Bettina H.
The whole weekend was wonderfully organized. We were all kept busy but not too busy and I do love an itinerary! My only regret was not getting to know everyone better. – Susan D.
I thought the experience was great. I came to just hike and see the beautiful scenery but I truly learned a great deal from all of you. – Rachel M.
It was a great trip! Our section of trail in the Roan highlands provided great diversity and a nice sample of what life is like on the Appalachian trail. – Charley S.
Andy shared his knowledge and led in a very polite and professional way throughout the trip. He went above and beyond to see all participants were safe, learning and enjoying the trip. The materials provided were extremely useful.� Am not certain anything should be changed however I would like to be able to attend again, perhaps enjoying a longer hike. – Diana B.
I received excellent tips to make next trip more enjoyable and less effort in a supportive environment. Not sure what you could do better--already topnotch! – Elizabeth R.
This trip was a wonderful experience. It was FUN, and the workshops were so informative. I feel the confidence to repeat this adventure on my own. The section of the AT is simply spectacular! This adventure is so inspiring! I will definitely do this trip again and hope some of my friends will too. – Edda K.
We learned a lot of new information about how to prepare ourselves for backpacking. It was great to be able to rent some equipment and try it out before making the investment in backpacking equipment. I also loved that you tailored the information to what folks wanted to know. Wonderful experience overall! – Kari M.
I wouldn't change a thing! This was an absolutely wonderful experience! Every detail was planned and well thought out by our guide. I wouldn't have any hestitation in recommending this trip to a someone who has never backpacked, a beginning backpacker or someone who want to brush up on their skills. I am really looking forward to attending OAC trips in the future. Thanks so much for an excellent experience! – Amanda R.
The guide was a great leader. I will definitely do another. I look forward to the Appalachian Trail next year with you. – Jessica H.
This was a great workshop. – Eira. T.
I wouldn't have changed a thing! I really enjoyed the dinner samples and playing the LNT ethics game. From start to finish, the whole trip was fun, educational and well-planned. – Summer K.
This was a wonderful experience that increased my confidence not only in my ability to backpack but in myself in general. There is nothing I would change. – Jackie B.
I liked the option of hiking at our own pace on sunday morning, not being in a hurry to get to the hostel. Everything was perfect. Thank you so much! – Margie H.
The guides made everyone feel welcome and safe. – Nicole L.
What can I say - I DID IT!!!! It was not as bad as I feared, and better than I hoped. – Jane G.
Great backpacking adventure! Had a great time, met new folks and learned tons. Thank you. – Janet S.
The guides are amazing! I take away from this adventure feeling empowered and self reliant. Watch out World!! – Kimberly P.
I love the trip. I can't say it could be any better! – Ira G.
The guides are knowledgable and their presentations were relevant to our needs as beginners. Both were positive and encouraging in their approach to us. The program exceeded my expectations! – Bill K.
The loved the amazing attention to detail and the supportive environment that the guides provided. Surprising to myself, I really enjoyed the yoga. And of course the hiking. The fantastic leaders set the tone for a group. They encouraged a supportive female environment from the start and ensured everyone felt comfortable and included. – Ellie H.
The entire experience could not have been better. I will cherish the memory of our laughs and the breathtaking views for years to come. – Matt P.
I don't think you could have done anything better. Your attention to detail and consideration for others are tremendous. Everything was top-notch. Thank you! – Shauna M.
It was physical and labor intense which gave me a great sense of accomplishment. Thank you Andy for the week I needed that escape and opportunity to see what I could do. – Debbie B. Thank you so much for the memorable experience!! I throughly enjoyed it and will remember this gig for a lifetime! – Prasad T.
Fantastic trip and a great time. Looking forward to participating in more events! – Shawn L.
The trip and workshops were fantastic. I met some new friends and learned so much. Thank you so much. This is just the beginning for me! – Normajean R.
I thought the way the workshops were spread throughout the trip worked very well. I appreciated how candid the guides were in their presentations and in response to questions. – Eunice H.
Had a great time, and everyone was friendly and fun as usual. Weekend was well organized, and super relaxing. – John S.
This trip far exceeded my expectations. – Nancy B. It is perfect. – Mary M.
I liked the variety of activities that were offered. The guides were very energetic and informative about the activities. I really enjoyed the Kristy's program on stress management at the beginning of the retreat. – Heather P.
I liked all the different workshops. I liked hearing advice from all the guides. – Teri H.
I liked Andy's leadership style: allowing flow to the work ; encouragement; teaching; sense of humor, appreciation and respect for each person. – Karen K.
I really enjoyed all. I feel a lot better thanks to this experience and feel more comfortable – Teresa P.
We wished the trip hadn't come to an end. Thank you for sharing your expertise and bringing us all together. – Terry O.
I can't wait until my next adventure with OAC. THANK YOU FOR EVERYTHING, especially the memories :) – Lucy W.
I liked how open the guides were to questions - felt like I could ask anything, no matter how silly or trivial it was. – Fran G.
I had a wonderful time with a really positive hiking group. – Robert R.
Guides were great. Perfect team that complemented each other perfectly. Very patient and addressed everyone's unique needs. – Toni M.
This was a wonderful way to test out if I still wanted to backpack after all these years. Andy was very helpful and gave some incredible workshops with Yvonne. – John S.
Just wanted to let you know what a spectacular weekend we had. I could not have been happier signing up for this trip. For a while, I've been wanting to do more backpacking, but just now brave enough or confident enough to venture out on my own. – Nancy B. Great fun excellent accommodations and planning. – Jeni W.
I thoroughly enjoyed this trip! The workshops were extremely helpful when considering planning a trip on my own. I loved having only women on the trip. Nothing against men but a trip with only women has a completely different energy and it was wonderful. – Terry C.
It was just a fantastic experience and I now have new memories and new friends for life! – Rupa F.
This trip was one of the best times I've had in a long time. I'm not really sure what I would change. The gear list was very clear. The guides were very open and helpful with there thoughts on different gear and tips to make things easier. Thanks for a great trip. – Jeremy L.
I wouldn't change anything. It was quite the learning experience for me. Both guides were professional and helpful and kept our safety as their first priority. – Terri C.
I really, really enjoyed this program. I thought the workshops were interesting and informational. I really liked that you showed us different things like with the stoves and how to bear proof our food. I appreciated that we went slow and had breaks to ease us into backpacking. It was informative and fun. Thank you! – Maggie U. Everything was so organized and fun and laid back. Can't remember when I have been so pleased with a group outing. Andy and Yvonne were so helpful. They constantly showed care and concern for every hiker. It will definitely be a cherished memory. – Terry B. Best weekend ever!!!!! I was inspired by both of my guides as well as my fellow backpackers to challenge myself to do things that I thought were beyond my own capabilities. The workshops were extremely informative for a beginner backpacker like myself. – Rose K.
I would not change a thing. Andy is very patient and a great teacher. I learned much on this hike. – Michele D.
It was awesome! Enjoyed everything, even the rain!! Looking forward to more backpacking trips! – Gwen T.
The educational aspects were excellent, easy to understand and very informative. I especially enjoyed Leave No Trace, tips on gear and the food preparation/tasting demo. – Charley S.
The guides took the time and energy to produce a great experience. – John L.
I thought the hike and workshop were excellent. I think even experienced backpackers can benefit from this workshop. – Ned P.
Thanks for a great weekend! Cathy and I had a wonderful time and it was a good learning experience. We certainly enjoyed your enthusiasm and passion for hiking. – Steve M.
There isn't just one thing that I loved about this trip. It was a wonderful experience all around. The group I was in was fantastic, helpful, kind, positive, adventurous, courageous, and honest. I felt completely comfortable with the group, and the level of intensity of the hike was exactly what I was looking for. – Shannon M.
Very well organized! I liked how the team worked together to share their knowledge and experience with all of us. I liked how the guides were patient when we asked questions and the overall wonderful comaraderie of the group and relaxed atmosphere throughout the weeekend. Overall experience was great! – Helen M.
You really raised the bar for future trips! The scenery was spectacular. It was good to brush up on my water-crossing skills, too. This may become one of my favorite hikes ever. – Glenn R.
Amazing program, amazing experience! I will definitely backpack with OAC again – Ellen S.
I learned lots of little tips for efficient backpacking and met some great new hiking buddies. – Tali H.
What a great weekend! Great seeing everyone. Absolutely wonderful company! – Jenny W.
The entire trip from start to finish exceeded my expectations. Even though we had rain during portions of the adventure, that didn't change a thing! May even made the trip a bit more challenging. Do not change a thing, all breakout sessions were great. – Doug L.
I especially enjoyed the creek crossing! I was also very glad to learn about additional techniques for hanging bear bags and all sorts of general safety tips. I can't think of anything I would change - even glad I now know how to handle backpacking in the rain. – Jessica C.
It was great being able to stay in cabins, not camp out. The friendly and involved park staff made the event a sure success. – Frank C.
Even though it was cold and windy, it was a good trip and I'm glad I went. The workshops were interesting and educational. – Robin Y.
I enjoyed every aspect of this trip. The guides were the greatest. I hope to backpack with you again soon. – Cathy F.
I loved being able to experience what it was like to hike the AT on my own. I liked finding my pace and having a goal location to find along the way. It was a wonderful experience!! – Sara D.
I've loved the positive energy of the group, highly motivated by the guides. Andy, you've done a fantastic job at making us believe we walked around the world :-). This shows how well organized and planned everything was. – Marta A. The entire trip was great. I was at ease as soon as I met all the guides. They were professional and made the trip a fun learning experience, even in the rain. I couldn't ask for a better program to learn backpacking skills. I'm thankful I signed up. Thank you for a great adventure! – Catie H.
Andy and his team are extremely knowledgeable and friendly. They provided valuable beginner backpacker information in a welcoming and encouraging environment. – Terra D.
The guides were very helpful and accommodating. – Jim H.
I enjoyed meeting new people and conversing with them. – Ned P.
The loved the opportunity to backpack with a group of newbies and with very knowledgeable guides. Don't change a thing. – Kathi M.
I absolutely loved this trip! Everything about the trip was perfect thanks to Andy and Yvonne. I had a blast, learned a lot and wish it would never end! – Lucy W.
This was my first backpacking experience and I feel like I learned so much. All of the workshops were informative. – Robin T.
The guide's depth and breadth of knowledge of backpacking and the outdoors was amazing! – Connie M.
The whole weekend was an incredible experience. It went far beyond my expectations. – Shelly M.
Thanks for putting the trip together! It was a good shakedown for my upcoming Appalachian Trail hike. Company was great. – Jeff H.
I was super impressed with the workshops. The Ethics of the "Leave No Trace" principles are very important to me, and I was so pleased that they were stressed and practiced through out the weekend. – Shelly M.
I loved what we did and where we stayed. Best guides I have ever met. Loved every minute. And they were so kind and patient teaching us stuff. – Tippi M.
Amazing lovely ladies with fun hearts! Attention to all of the details! – Sally H.
I loved meeting new friends and comparing equipment. I don't think I would change a thing. I liked the fact that every time we talked about things like water filtering or camp stoves, someone there had used something different and we got to see how they worked. Visual experience is always the best. – Sara D.
It was all excellent. I would not have changed a thing. It was as described when I signed up. The guides were so helpful, informative, answered all questions and were only encouraging in all our efforts. I give them an A+ – Kelly E.
What I liked the best was the core Leave No Trace principles that laid the foundation for the entire trip--outdoor ethics. The importance of respect for nature and minimizing the human footprint had personal impact for me. – Karen P.
I loved the trip and enjoyed it throughly! I was anxious before the trip because I wasn't sure if I brought the right items but Andy made me feel confident in my pack right by reviewing its contents and telling my why I needed/didn't need certain items. – Ashley V.
This was a great weekend for beginners. It definitely makes you want to keep on backpacking. – Theresa W.
I loved every minute, every aspect of this trip. Would love to do again...right now!!! Love that Andy builds our confidence level and makes the experience so enjoyable. Best guide ever!!! – Johnene I.
I enjoyed every minute of this trip. The guides were great in answering questions, and giving encouragement. I really learned a lot. – Rhonda B. We had an amazing time even in the rainy weather!!! – Dawn L.
I was pretty impressed. Wouldn't change anything, really. – Tim S.
What I liked best was all of the knowledge and experience Andy shared. I learned so much and had an absolutely memorable adventure. – Leigh L.
The views were beautiful! I enjoyed meeting new hikers. – Yvonne E.
Great group of people.�You are so knowledgeable and great at sharing.�Don�t change anything. The trip was everything you said it would be. – Deb G.
Andy is a great leader; he helped us with our weaknesses and praised our strengths. He provided a nice balance of group hiking and also let us hike at our own pace. I would recommend this trip to anyone who has interest in hiking any type trail for an extended period of time. Experienced hikers would definitely benefit as well. If you have every wanted to "get out there" this is the trip to take. – Charley S.
A great weekend trip with energetic and spirited hiking company! I had an awesome time. Thank you to Andy for leading us and planning all the details. – Laura L.
I liked learning the principles of Leave No Trace. It is nice to know your program leaders have such a true passion in what they do. – Linda H.
I enjoyed the entire trip. he entire group had a terrific attitude about all the unexpected challenges we faced because of the weather. I think it was fantastic that the guides were able to be flexible, and had extra supplies to help us contend with the weather. – Krisy C.
Thank you for such a fun weekend. Andy did a great job planning the trip. What a fun group. – Amy C.
I thought the trip was very educational, especially for those really interested in learning key backpacking skills. – Carol C.
I loved being able to talk to all the instructors about their experiences and ask them any questions I had. It was awesome meeting so many fun people! – Jaime S.
A perfect "beginning".... Our leaders were educated, informative, sharing, real and FUN! Andy was aware of each participants needs, comforts and limitations. – Terri J.
I liked the individual instruction/attention received regarding tent set-up and backpack fitting. I felt the guides were truly devoted to sharing their joy & knowledge of backpacking to all. – Pat S.
I LOVED how open and helpful the guides were. They really went out of their way to ensure we felt comfortable to ask whatever questions popped into our heads and make sure we were all having a great time. – Lauren B. The guides did a great job explaining everything in detail and was very easy to talk to. Any question I asked was answered thoroughly. My wife and I really enjoyed this experience! Highly recommended! – Joe T.
Enjoyed the workshops and camping site. Thought everything excellent. – Ridge A. We would never have done our first AT trip if not for Outdoor Adventure Connection. The whole trip was awesome. I love that you even arranged perfect weather for us. I learned so much and feel much more comfortable now about hiking overnight. – Teri H.
The training was exactly what I was looking for. Yvonne and Lucy are AMAZING women, and I feel very luck to have had the chance to learn from them. – Andrea W.
Absolutely great trip. Thanks Andy for your organization, encouragement, and positive approach. – Cathy V.
This trip went far beyond my expectations. The details that were put into the trip, preparation, workshops, activities, handouts, follow-up, pictures, were all 'extras' that were not expected. – Jessica H.
I really liked hearing about everyone's different experience and the tricks they learned while backpacking and camping. It was a great experience and I got to meet lots of really energetic, nice and wonderful people! – Katie H.
Excellent! I loved the small group and challenging of hike. I enjoyed tent camping for three nights. – Sally D.
The program covers the ethics behind Leave No Trace principles and why we all should try our best to be good stewards of our environment. Captain Blue's leadership and interpersonal skills were second to none. He is the consummate professional but keeps the atmosphere relaxed, fun and flexible. Thank you for exceeding my expectations. – Dirk W.
This experience really boosted my confidence and knowledge of backpacking! We thoroughly enjoyed ourselves and meeting folks equally interested in backpacking. The guides are very knowledgeable and enthusiastic about this sport! The training topics were spot on. Saturday dinner was delicious and fun. – Amy S.
The trip has armed me with the knowledge that I was previously lacking in terms of packing needs, backwoods hygiene and Leave No Trace principlesc. Great job! – Jessica C.
Great learning experience and confidence booster. It was a prefect beginning experience. I will definitely recommend outdoor adventure connection to my friends! – Jamie A.
Andy, you couldn't be any better than what you are! We learned so much and you made us feel so comfortable and made it all fun! – Gina B. Overall a great trip, lots of information about backpacking learned. I hope to do Level II trip with you soon. – Bernie B. The challenge of the weather made the trip better. Being harder built my confidence. Andy and Lucy are AWESOME guides. – Mike L.
What I like best is learning survival skills out in the woods but also those that could be applied to every day life such as Stopa! – M.W. I honestly feel the retreat was perfect. The attention to detail was amazing! Each activity was perfectly planned. I will recommend this if available in the future to everyone I know and will attend myself as well. – Sherry L.
I enjoyed everything I learned over the weekend. – Denise K.
The trip was wonderful and inspiring. My favorite part was crossing the river. I can not think of any changes needed. It was also nice to meet others interested in backpacking. It was impressive how hard the guides worked to assist us setting up camp on a rainy day and then cooking so many different foods for us to try. I will book another trip! – Sally D.
Thank you Again Andy for a Wonderful Weekend. Beautiful Scenery, Perfect Weather and a GREAT group of Hiking Friends. These trips definitely allow me to go to places I would NEVER venture out on my own. – Kimberly S.
Well organized. Pace was perfect to new hikers. – Randy R.
Just cant wait for a longer trip!! – Darlene A. Had a great time! Guides were very knowledgeable and I loved how they shared their personal experiences and answered all questions thoughtfully and honestly. I will definitely take an advanced workshop. – Mike K.
Best hiking group ever! I loved the guides. They were both so kind and patient and answered all those questions I had about stoves, filters, packing backpack. – Tippi M.
I highly recommend Outdoor Adventure Connection to anyone considering a backpacking trip. This program teaches you all the fundamentals required to not only be safe, but also have fun and feel comfortable backpacking without a guide. Thanks so much! – Dirk W.
OUTSTANDING trip and experience! I didn't know a thing about backpacking before this trip and by the time we got back to our cars on the last day, I no longer felt like a novice! I feel very comfortable going backpacking again without my wonderful guides now and actually am planning on going on a solo trip soon. – Ashley O.
I just completed a 3 day solo hike on the AT. When my friend decided not to go, I relied on the experience gained from your backpacking course to do it solo. I want to thank you for course! – Carl R.
The trip felt like something out of a dream, seeing such sights. And just being on the AT itself, after spending so long reading about it. The trip gave me great confidence in my backpacking abilities, and made me feel sure I can thru-hike the AT when I'm ready. I can't wait to go back again in the future. – Alyssa R.
Given the challenging weather conditions, the trip was a fabulous success. I participated with a friend to encourage her to learn more about backpacking and build some confidence. – Lana P.
Enthusiastic knowledgeable guides make the workshop fun and educational. – Amanda L.
The course was perfect and so was the location. – Matt P.
The entire weekend and sessions were quite enjoyable and Very informative. I especially liked the bear nagging session, and how to pack your backpack. If you're looking for a great way to gain valuable backpacking tips information with memorable and safe backpacking, the Outdoor Adventure Connection is for you. – Karen M.
It was a great outdoor adventure that was emotionally, psychologically, and physically refreshing. – Karen P.
I would highly recommend the backpacking classes to anyone who would like to learn more tricks of the trade and find out how amazing trail magic can be. – Shannon M.
What a fabulous adventure! Where to start? This section of the Roan Highlands is magical in its beauty. The flowers, the trees, the boulders, the steep climbs, the grassy balds, set against the backdrop of mountainous ridge after ridge were breath taking. – Karen P.
I can't pick any one thing I liked "best". I thought the whole trip was great. You have done an outstanding job on the other trips I've been on with you and you did so again on this one. First rate all the way. – Jack L.
Terrific! Andy was incredible! I learned, was reminded of so many essentials backpacking tips, tricks, and essentials - all in a fun, casual, inclusive, encouraging and informative way. – Dawn B.
I really liked talking to the guides about their experiences. They made me feel very comfortable asking questions. The only thing I would have changed was for it to be warmer! ;). – Andrea C.
I feel more confident for future backpacking trips. I learned much more than I anticipated. Thank you. – Charley S.
The guides were terrific! Very kind and encouraging. The workshops were very informative- but I most just enjoyed all the stories and great tips that were shared throughout the trip. This was the best thing I have done for myself in a long time!!! Thank you from the bottom of my heart. – Laura H.
Would not recommend changing anything - had a great time ! !� Thank you Andy. – Sharon J. This trip was AMAZING! I can't say enough about how organized the trip was, how knowledgeable the guides were and how beautiful it was! – Stephanie P.
The guides went above and beyond to make sure "everyone" had a good time. 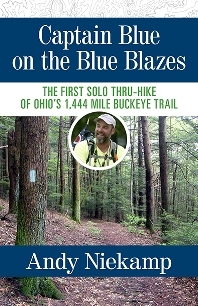 I would recommend this for any one interested in hiking regardless of experience level. – Myron H.
This trip had everything, great leadership, fellow hikers & weather. God blessed our trip, it was awesome! – Bob B.
I was really impressed by the Leave No Trace ethics game. It was really well done. – Margaret D.
I enjoyed a challenging backpacking experience. Andy is very knowledgeable and is always willing to help and answer questions. – Bill K.
I loved everything. I came home and weighed everything in my pack. – Teresa A.
I am so appreciative of the gentle manner in which Andy guides, coaches, encourages you to learn and grow. He sets you up so you feel confident to tackle a backpacking trip on your own. – Traci B.
I loved how everything was broken down and explained in an easy to understand manner. I had a wonderful experience and learned more than I thought possible. – Faith D.
I like the caving trip the best! There isn't an anything that I can think of that I would change. – Rita L.
The guides were friendly and helpful. The activities were varied and interesting. The cabins were lovely. – Patty H.
The trip and workshops were fantastic. I wouldn't change anything. – Normajean R.
We had an absolutely perfect weekend. The hiking pace was nice, the workshops were informative, and evening at the campfire trying out various types of freeze dried food and stoves was a blast. Thank you for a wonderful time. – Sophia Z. The group size was perfect, the route choice was very interesting, and best of all Andy fostered great conversation among the group. – David W.
The trip was a wonderful experience and one I never thought I would get to have. – Cara S.
This was a great introduction to backpacking. A just right experience for beginners enhanced by beautiful weather. – Ellen G.
I loved the 'can do' attitude, no matter the experience level of the client. They gave me a lot of confidence that no matter your experience level or physical fitness level, this can be done. – Traci B.
I loved the scenery and the knowledge that the guides possess! They always have a great tip for each scenario. Only experience can teach that! Very easy to talk to! Can't wait for our next trip! – Joe T.
I was glad to finally see how much a 23 lb pack feels when hiking. It wasn't bad at all. The guides are very knowledgeable and enjoy sharing their experiences with others. Their personal touch with everything from breakfast to best practices was awesome! – Jill B. It was perfect. I liked the challenge on the trail and the size of the group is great. Perfect trip. Would like to be able to do more. – Andrea W.
I liked everything! – Lori D.
Totally enjoyed the experience and new knowledge obtained. – Gregg W.
I liked the different demonstrations on equipment such as the stoves, water filtration, and hygiene for females. This is a great workshop for beginners and I can't think of anything that would make it better. You have done a great job and you have awesome guides! Thank you for a great experience! – Erika O.
Amy and Yvonne are excellent leaders and work well together. Very professional and well educated. They made the experience enjoyable and backpacking seem very manageable and meaningful. – Lori D.
I had no backpacking experience. I knew nothing about equipment or how to prepare for backpacking. But I do now. Thank you! – Deb G.
The trip was very informative and answered many questions that I had about backpacking. The park was lovely and had great terrain. The guides were friendly and knowledgeable. I would do this trip again and recommend it to others who were interested in backpacking. Thank you! – Robbin C.
Every detail of the hike was well planned. The information provided beforehand was very useful and Andy's guidance during the hike enabled us all to have a great experience. I enjoyed the challenge. It was an amazing experience! – Bill K.
I loved having the park staff involved and our group breakfasts. – Karen K.
I can't think of anything to change or do better. The park, facilities, trails and amenities were absolutely wonderful and beautiful. Very happy! The guides were great! They were interesting, provided a personal experience and were so very knowledgeable. So enthusiastic! – Debbie D.
I had a wonderful experience. – Karen P.
What an absolutely wonderful weekend this was! It was refreshing, challenging, relaxing, fun, therapeutic, inspiring, energizing, esteem building, educational and informative. The weekend was filled with new and unique experiences for me - caving, yoga, yoga in a cave, gourmet dining. Loved all of the caves we were able to see on the hikes and also the ones we were able to explore. I didn't realize how fun it would be to get up close and personal with a cave by crawling in the dirt on hands and knees. Sign me up for the next retreat! – Karen P.
This trip is a hiker's dream. I learned how to navigate the AT while enjoying the company of others and the expert guidance of Andy Niekamp. – Rita S.
I had so much fun, learned so much, and connected with great women. – Eunice H.
The guide was great! She was so patient and caring. I believe she went above and beyond. – Carrie N.
I loved the entire experience! I hope to go on additional trips in the future! – Cindy S.
I loved the way the information was presented and the environment the guides created! As a new backpacker, I learned a lot - but I also learned that I still have a lot to learn! – Morgan H.
Every excursion was well planned and detailed. I enjoy being pampered as well as being fit. – Jennifer L.
Andy and Glenn did an awesome job in making us feel comfortable. It was such a nice group of people, beautiful place, making for a truly enjoyable weekend! – Barb L.
I really liked the relaxed, low key atmosphere. I think that having leaders who are knowledgeable without being overbearing really helped everyone relax and enjoy the experience without feeling intimidated. – Amy G.
I really liked the planning that was evident on this trip. No one can predict the weather - and we certainly experienced 3 of the 4 seasons - but there were plans in place to deal with whatever mother nature threw at us. – Linda M.
The trip exceeded all expectations I could possibly dream up and I can't wait to go on my next trip with y'all. – Lauren B.
Andy and Yvonne planned every step of this trip with meticulous detail. I feel so proud of what I've accomplished. Thank you, Andy, Yvonne and Outdoor Adventure Connection. – Karen P.